For decades, there was no standard or minimum required training for shelter workers hired to euthanize homeless animals. With untrained euthanasia technicians, animals would suffer inhumane deaths. Nightmarish stories of animals waking up in freezers were all too common. 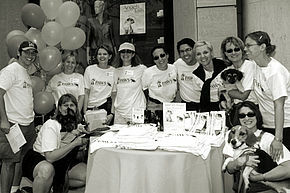 By working with state officials and the ASPCA, PAWS Chicago helped pass the Humane Euthanasia in Animal Shelters Act, which Governor George Ryan signed into law at the PAWS Chicago Lurie Spay/Neuter Clinic on August 21, 2001. This important bill requires euthanasia agencies and euthanasia technicians to be certified, inspected and regulated by the Department of Professional Regulation at least once every three years. 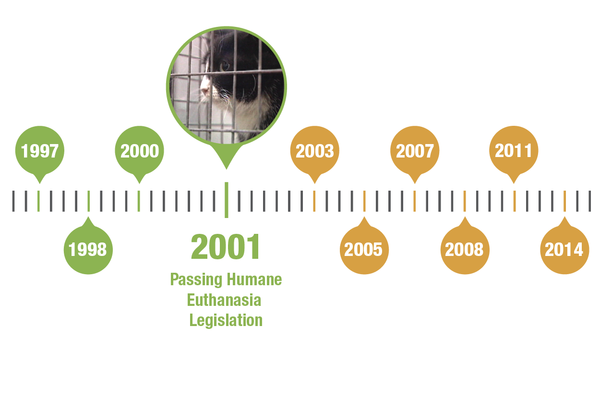 This legislation is an important precursor to building a No Kill community. In a model community, all private shelters are No Kill, dedicating resources to rescue, treat and rehabilitate the animals coming into city facilities. When there are minimum standards in place ensuring humane euthanasia at municipal animal control shelters, there is no justification for private shelters to replicate government services and euthanize animals.